The Aspire V5-571 is Acer's latest offering to the 15.6" notebook market. Finished in a neutral black colour scheme, it provides a 1.7GHz processor in the form of Intel's Core i5 3317U together with 8GB of RAM and a substantial 500GB hard drive. Operated by the latest Microsoft Windows 8, the 15.6" display provides a clear window, and battery life of up to 5 hours means this laptop is suitable for those frequently away from home or the office. Read on for our Acer Aspire V5-571 review. 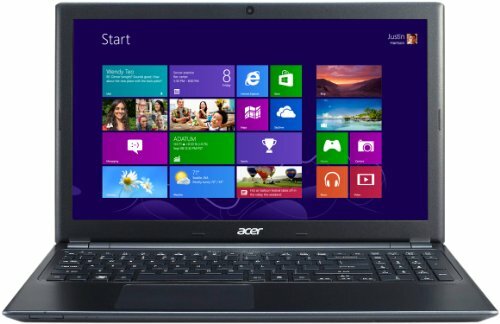 Below is our review of the Acer Aspire V5-571, a 15.6" laptop, featuring 8GB RAM, 500GB hard drive and Windows 8. Priced in the mid range of the laptop market, the Acer V5-571 provides a fairly competitive list of features for around the £490 mark. Finished is a sleek and stealth like matte black exterior, the V5-571 pairs the Intel Core i5 3317U with 8GB RAM, to complete what on paper looks like an ideal all rounder notebook. The Acer HD screen measures the standard 15.6", in the 16:9 format, with a resolution of 1366 pixels by 768 pixels. Overall we liked this display - with sharp graphics and vivid colours, it was comfortable to work in front of. The Core i5-3317U from Intel is a ULV processor, based on Ivy Bridge, and was released in early 2012, offering 3 MB L3-Cache. The dual cores can handle up to a maximum of 4 threads running in parallel, making better usage of the central processing unit. Operating at a base rate of 1.7GHz, each individual core can dynamically increase up to 2.4GHz (for 2 cores) and 2.6GHZ (for 1 core) with Turbo Boost. As mentioned previously, it also offers 8GB RAM and an integrated graphics card - helping to keep applications running fast. In terms of storage, Acer have fitted a 500GB hard drive to this particular model, running at a rate of 5400rpm, and installed to this is the latest version of Windows - version 8. In terms of external connections, you are supplied with a multitude of options: a DVD drive, 3 x USB ports, one of which is 3.0, with the other two being USB 2.0, HDMI output, Ethernet, a joint headphone and microphone jack, VGA, as well as a multi card reader offering access to SD, MMC, MS PRO and xD formats. The V5-571 measures 38.2cm by 25.3cm by between 2.5cm and 3.3cm in depth, weighing in the region of 2.6kg. The keyboard and touchpad continue the black theme of this notebook, and both provided our testers with easy input. The touch pad in particular, located slightly to the left of center, offered accurate control, and was praised by our users. So overall what did we make of this latest mid priced model of the Aspire range? Decent specification, great screen, offers good value overall. No real faults or criticisms to speak of. If you're after a reasonably priced laptop for all round general use, then the Acer Aspire V5-571 is well worth taking a look at.